Have you ever bought a book just because it had a really intriguing title? 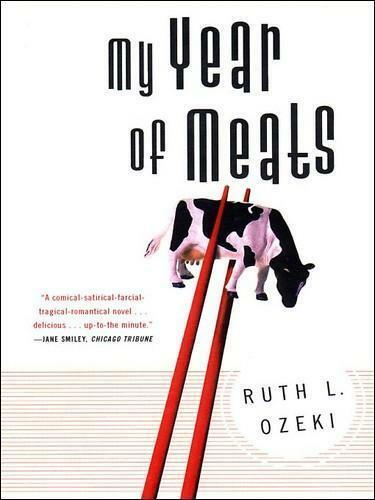 That was how My Year of Meats by Ruth Ozeki ended up on my Amazon wishlist. Touted as a documentary-style work of fiction, it is both a story of relationships and a critique of the meat industry (which I freely admit I am a consumer of, so reading this book gave me the heebie-jeebies on occasion). The dynamics of the two main characters seemed, I imagined from the synopsis, very interesting indeed, and they did not disappoint. The narration is primarily from the point of view of a Japanese-American woman named Jane, who is hired to work for a Japanese studio producing a television show called "My American Wife." The show explores the lives of American families and is sponsored by BEEF-EX, promoting the use of American beef in Japan. (I only ever remember buying Australian beef in Japan, but what do I know!) The rigid rules imposed on her direction - only "perfect" Caucasian wives cooking with real American beef - cause Jane to stretch further and further in trying to show not just storybook people, but real families of different races, orientations and religions. Alongside Jane's narrative is the story of Akiko, wife of Jane's boss and a very delicate woman struggling with abuse, infertility and an eating disorder. Her husband forces her to watch "My American Wife" and rate it as well as preparing all the recipes to help her increase her weight. His actions, however, cause her only to grow further away from him, and she becomes emotionally invested in the families Jane selects from the show. She grows out of her complacency and begins to really think about what she wants for her life. Toward the end of the novel, the documentary side of the story becomes quite harsh as Jane exposes the truth behind the chemicals, hormones and terrible conditions the animals are living in. Soon, it becomes her personal mission not just to hint at the dark side of the industry, but to expose it fully to the public. I enjoyed My Year of Meats, though at times I felt it focused too much on the anti-industry theme and not as much on the characters as I wished. Still, it was an interesting way of presenting a topic that the average person might not be likely to pick up a book about. For the most part, I liked the characters - Akiko was sympathetic and well-written; Jane's perspective was much harder to identify with, but interesting nonetheless. I enjoyed the minor characters like Miss Helen, whom we saw very briefly but received a very realistic impression of. Others, like Mr. Ueno, seemed to fall a bit flatter. 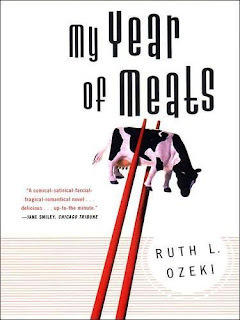 Check out Ruth Ozeki's My Year of Meats on Amazon.com or Amazon.ca!